‘Metroid: Samus Returns’ is a fantastic reimagining of an under appreciated classic. 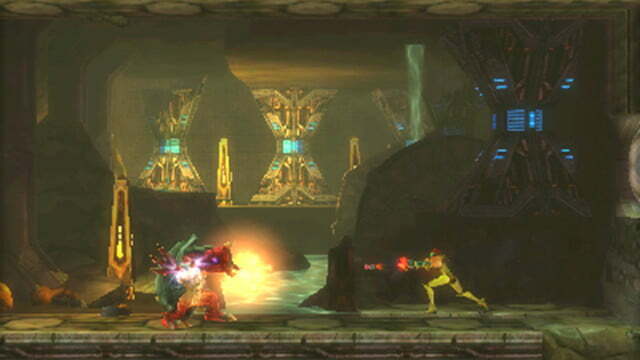 It’s been 14 years since we’ve had a “proper” 2D Metroid game, but you wouldn’t know it from how frequently the name gets tossed around in gaming circles. “Metroidvania”, the subgenre of exploration/action platformers derived from the pseudo open-world mechanics popularized by Metroid and Castlevania: Symphony of the Night, is as popular as ever. It shows up just as frequently, and sometimes alongside the more recent “Soulslike” sub-genre in popular new titles like Dead Cells and Hollow Knight. Although the early 2000s saw a steady stream of 2D Metroid and Castlevania games for Nintendo’s handhelds, that well had apparently dried up, until now. We eagerly strapped on our power armor once again with galactic bounty hunter Samus Aran for our Metroid: Samus Returns review. Metroid: Samus Returns is a “reimagining” of 1991’s clunkily named Metroid II: Return of Samus for the Game Boy. It remains true to the core of the classic original, but with additional mechanics (some from subsequent series entries, some wholly new), which elevate it beyond a simple remaster. Castlevania: Lords of Shadow developer MercurySteam tackled development, but under the experienced leadership of Nintendo stalwart Yoshio Sakamoto, who co-created the series and directed most of its classic entries. That combination of fresh eyes and series experience ends up striking a perfect balance, with a game that is rooted in nostalgia, but feels like more than a cynical cash-in. Metroid II, hamstrung by the limitations of the original Game Boy’s hardware, is an under-appreciated classic, and Samus Returns finally gives it the polish and new audiences that it deserves. Samus Returns picks up after the events of the original Metroid. 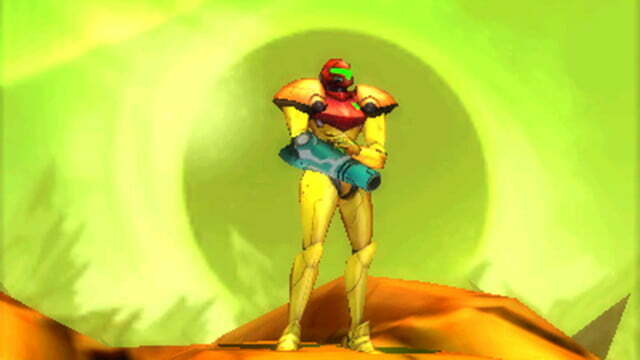 Disturbed by the apparent power of the metroid aliens that bounty hunter Samus Aran faced on the planet Zebes, the Galactic Federation sends her to metroid homeworld SR388 to eliminate the threat at its source. Apart from an opening text crawl, there’s virtually no explicit narrative during the game itself. Instead, the action is structured around Samus exploring deeper and deeper beneath the planet’s surface, hunting down the eponymous metroids. A counter on the lower screen starts at 40 and ticks down as your take out your targets, giving players’ a sense of the game’s otherwise non-linear game an overall tempo. The world is broken into a series of discrete areas, separated by elevators, which grow more dangerous the lower you go. The defining quality of any Metroid game, of course, and the core of its namesake genre, is that Samus finds powerful upgrades to her suit that give her new abilities for both combat and exploration, opening up new parts of the map in fits and starts as she earns the abilities to bypass the various obstacles. 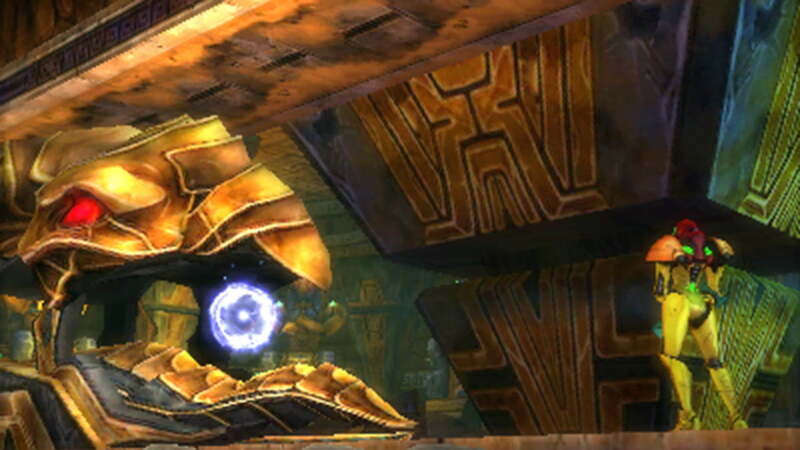 These include buffs to Samus’ weapons and armor, higher jumps, and the ability to crouch down into her signature Morph Ball sphere and roll around, eventually across walls and ceilings with the Spider Ball upgrade. There are also abilities that didn’t show up until subsequent games, like the Grapple Beam or Super Missiles. That structural mechanic, commonly referred to as “gear-gating,” is a tried-and-true design school now, but Samus Returns shows that the original may still be the best. Powers arrive at a generous clip, giving Samus an ongoing sense of progression. Crucially, all of her abilities feel great. Suddenly being able to leap twice as high, ignore water, or shoot through obstacles feel like you’ve applied cheat codes, trivializing challenges that had you pulling your hair out an hour before. When the original came out for Game Boy in 1991, some praised its elaborate, contiguous level design, but many were put off by the limitations of the hardware. Its greyscale graphics made many of the game’s caves hard to distinguish (which was particularly troublesome without a map to help in backtracking), and the minimalist soundtrack translated to dissonant bleeps and bloops on the Game Boy sound chip. The 3DS is put to great effect here, giving the game a rich and colorful environment and a moody, atmospheric score. Gameplay is still 2D, but 3D graphics allow for a fantastic amount of background detail (like huge, mysterious creatures lumbering around) and occasional nice little cut scenes. When did she learn to do that? Not content to simply remaster the original’s classic gameplay, Sakamoto and MercurySteam added a whole new set of abilities, called Aeion, which spend energy from their own meter. 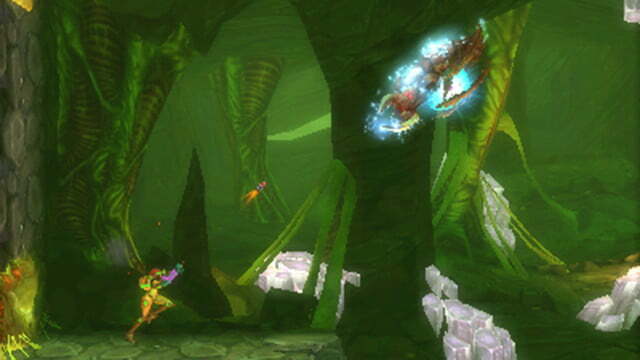 The first of these, Scan Pulse, takes a big swing at the game’s core exploration mechanic by revealing a large, square area of the map around Samus. The original Metroid II didn’t feature a map at all, let alone the ability to remotely scan it. For new players raised on the mini-maps, HUDs, and objective markers of more recent games, these quality of life improvements go a long way toward making it more accessible. While it doesn’t disincentivize exploration, which we were concerned it might, it does pull players’ attention to the map more frequently, mitigating the need to pore over every tile for secrets. On the one hand, we happily relied on the map to cut down on tedious and unnecessary backtracking. On the other, we lamented how it dilutes the immersion in the game’s exploration. One of our favorite things about The Legend of Zelda: Breath of the Wild earlier this year was how it embraced a retro sensibility of minimal extra information, situating the player’s attention squarely on the action itself. It’s far from egregious, but the addition of mapping features to Samus Returns is the one modern touch we slightly regret. The other Aeion powers, such as a rapid-fire cannon blast, a damage-absorbing lightning shield, and the ability to slow time, do less to alter the general flow of the game, but are no less useful. As with the series’ traditional abilities, they are versatile, addressing specific traversal challenges, while also presenting new tactical options for combat. The new resource for you to manage slots naturally into the flow of play, adding depth without becoming overwhelming or fiddly. Combat generally feels meatier here than in the original. 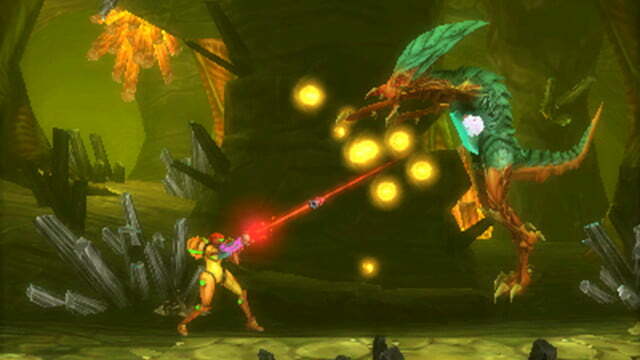 Samus’ previously fixed aim has been unlocked, allowing her to plant with the left shoulder button and aim in 360 degrees , making fights much more nuanced. A new melee counter, in which Samus swipes upward in a wide arc, is probably the new feature that you will utilize the most out of necessity, since combat has been somewhat fundamentally rebuilt around it. 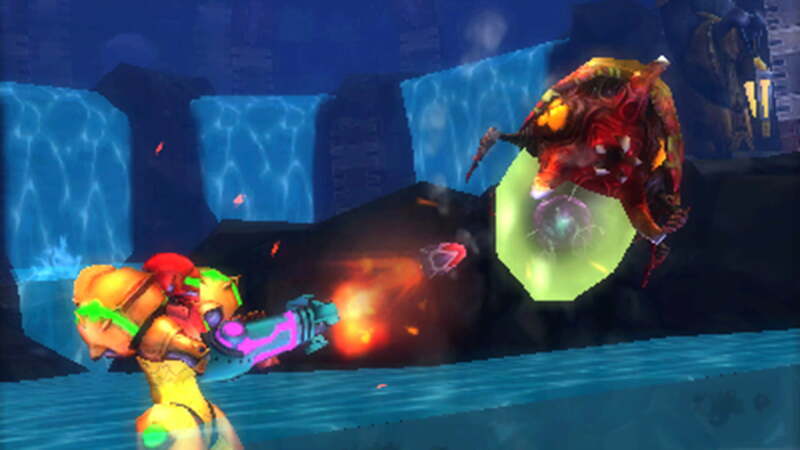 Where the original Return of Samus allowed to hang back as far as possible to pick off enemies from a safe distance, the enemies in Samus Returns are much more aggressive, forcing Samus onto her back foot. 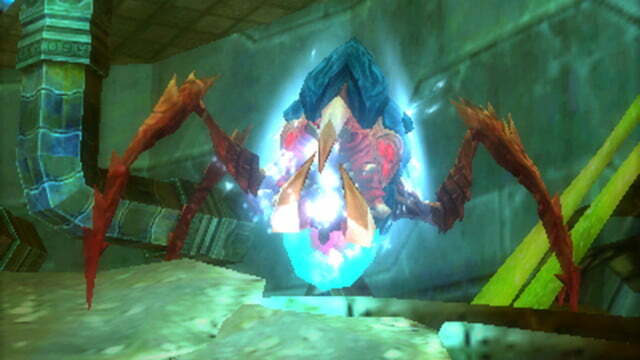 Virtually all enemies and bosses will occasionally flash a pulse of white light immediately before swiping at Samus. A well-timed melee counter will deflect this attack, stunning the enemy with a critical and opening up a chance for you to pump them full of energy or missiles, but getting it just right can be finicky, and a slight delay before you can try again means that timing is everything. The result is that combat feels much more rhythmic and reactive than previous entries. Even the game’s less powerful enemies deal a punishing, old-school amount of damage, making it all the more dangerous to get in their faces like the melee counter forces you to. 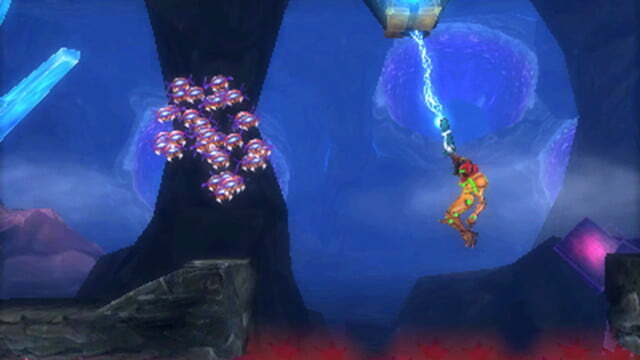 Boss fights against the metroids in particular are all about dodging and waiting for the right moment to stun them and take a chunk of their health. 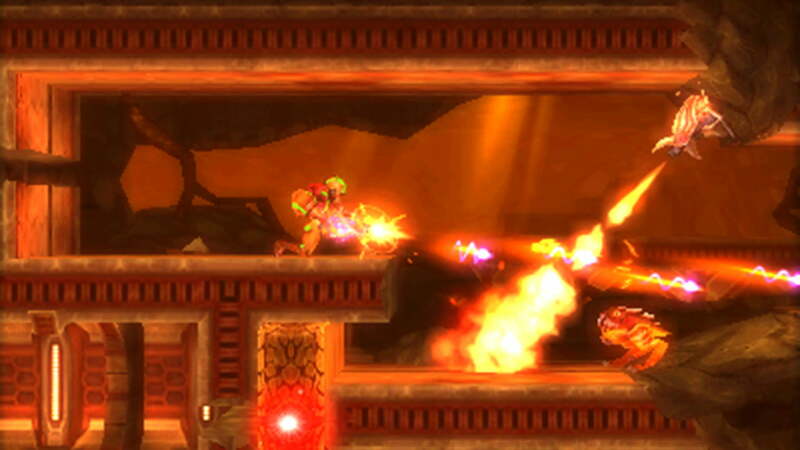 Enemies go down much more quickly this way than with just conventional fire, and some are difficult to handle at all without it. Purists might be put off by such a fundamental change to the rhythm of combat, but we liked it. This game in particular from the series is about Samus being alone against a world that wants to swat her like an insect, and the new combat system makes those stakes more apparent from moment to moment. Combat is more immediate and reactive than in previous entries, making every encounter a little more tense. The metroids themselves may be the weakest link in an otherwise solid enhancement of the original. 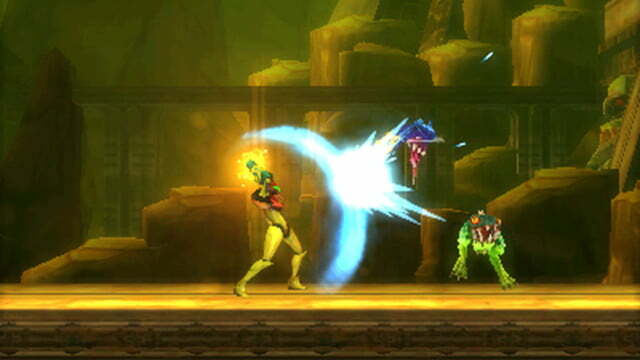 As the game progresses, Samus witnesses the metroids shed their skin and evolve into increasingly powerful and elaborate forms, but the slow rate at which this happens leaves the metroid battles feeling a bit rote and repetitive. The endgame evolutions add some nice variety, but it’s too little, too late, when you’ve spent most of the game repeating the same battle so many times. Nostalgia guides much what gets made in video game industry right now, with reboots, remakes, and remasters dominating the release calendar in lieu of riskier, new titles. Metroid: Samus Returns is far more than a simple rehash. Rather, it takes an underappreciated classic, whose design influence is perhaps felt more widely today than ever before, and enhances it for new audiences. The core of the gameplay remains largely untouched, but what new additions there are enrich the overall experience. The first classic 2D-style Metroid in 13 years (since the GBA Metroid: Zero Mission, also directed by Sakamoto), Metroid: Samus Returns is the franchise in top form, and makes an excellent case for the old masters. No. A storied franchise that spun out a whole genre, there are a lot of ways to scratch the itch for open-world 2D exploration platforming, from proper Metroid games through modern spins like Dead Cells. As a modern re-envisioning of a well-aged, pure classic, however, Samus Returns is unparalleled. Our first play-through took roughly 10 hours, with over 50% of the game left to explore. Completionists will have plenty into which they can sink their teeth, let alone the harder gameplay mode that unlocks after beating it once. Yes. Metroid: Samus Returns is a great example of why the Metroid franchise remains to revered among gamers, and is one of the best titles at the tail end of the 3DS’s life cycle.